Laude San Pedro International College summer school will operate from 9am-2pm for children who have not booked lunch and 9am-3pm for children who have booked lunch. The summer school is open to children aged 2-14 years and will run Monday to Friday throughout July and August. Unfortunately, we only have 100 places available per day so early booking is advised. All children must bring a snack and a drink with them for the morning break as lunch is not served until 2pm for those that have reserved it. The Clubs Complete Summer School 2017 will run for 7 weeks in the summer from 03 July to 18 August and will be open for children from the ages of 2 to 14 years. English-speaking children will be encouraged to improve their Spanish whilst Spanish children will be encouraged to improve their English, helping them all towards achieving the best for their future. The focus of the programme is language immersion through fun and exciting activities. Intensive language classes are also available for €10/hour. 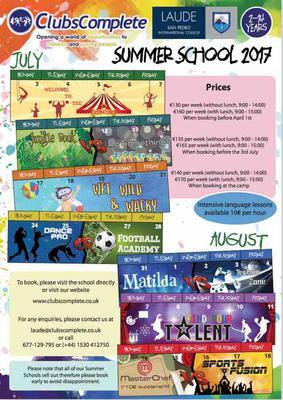 As always with ClubsComplete in the UK and Spain, we offer different themes each week so that children are entertained throughout the entire summer! All of our staff are fully CRB checked, have experience working with young children and are trained in safeguarding, and first aid. Staff are easily recognisable as they wear their ClubsComplete uniform at all times, we also ensure that any member of staff will have copies of their qualifications, CRB check, and any other documents required at all times. Click here for more Kids Camps. Looks like great activities for the kids, but seems a bit expensive at 120€ from 9-2. I guess this is for the wealthier families of Marbella. I guess its Nagueles Park again for a 3rd yr running for my kids in Aug for a couple of weeks. Kids love the park setting with animals, pool and art and cooking activities. Well organised and the kids love it! Our kids have been taking part in the "Time Travel" themed week and both love it! Great fun hearing their stories about ancient Greece and dinosaur excavations. The facilities are also very good, well protected and cool in the hot summer sun. The kids are also saying the lunches are fresh, tasty and nutritious. Post your own submission to the Marbella Community! It's easy to do. How? Simply click here to return to PARENTING: CAMPS & CLASSES & CLUBS.